Nutmeg: This upcoming year is your fourth year in camp! What experiences have led you to become a PD? Lucky: My first year I was an alpine specialist and I was in Session 1, and then I was asked to do Summit Gold, so I did two sessions my first year and that was actually really fun! That was the first year they did Beyond the Bell, so I got to do both Classic Camp and Beyond the Bell in the same year, and it was interesting to see the differences between those two different kinds of sessions. Nutmeg: What were the most notable differences that you noticed? What made an impact on you? Lucky: Classic Camp was, I guess, a lot crazier? [laughs] I was adopted into a boys unit, and they were just really rambunctious, they were like 11 and 12 and not really into it, but they were still really good kids. In Summit Gold though, I was adopted into Unit 1, and I got to be with girls- girls that were, you know, about to graduate from high school- and it was nice because it was just so calm. There were no kids running everywhere, it was just like everyone was supportive of each other and that’s so nice to see in campers. Like Classic Camp has its strengths too, but definitely so did Gold, and I realized I loved working with the older campers. Nutmeg: How was your first experience in UniCorps? Lucky: My second year of camp I applied for Corps, and my Corps advisors in my first year told me I should apply, so I applied and I loved it. I had the best kids ever, it was the best week of my life, and the best week of camp I’ve ever had- I’m still in contact with almost all those kids, a really good 3 or 4 I talk to on a regular basis, and one of them I’ve probably done at least 25 proofs of his college essays. 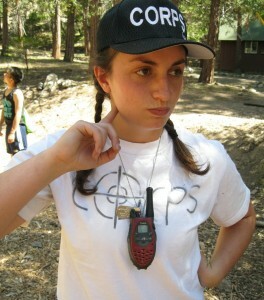 (laughs) But yeah I loved it, so the next year I applied for Corps PD. Nutmeg: What drew you towards PD? Are you glad you did it? Lucky: IT was overwhelming at first, but there’s something about Corps that just draws me in, and think it has such a good model to it, and it’s really integral to teach these kids humility and service to others and being able to take that back down the mountain and bring that back into your own community and knowing that you can instill change, all those kinds of things, so I guess that’s why I decided to do it. This year, I was kind of hesitant about what I wanted to do and I really wanted kids again, so it was a long process, and I was wondering if I should do WALL or another OCP- but I really wanted to stick to the older camper programs, I feel like I connect with those kids the most- so I ended up doing PD again. There are a lot of things I think I can improve upon, and do better, and I feel like I have that advantage, so I can learn and grow and I hope it can be an even better program than it was last year. Nutmeg: What are some things you want to change this year? that they’re basically now like the adults of camp, so they really need to step up and be that role model for the others- although its not the most glamorous of work, its something we want them to learn, so they can take that back home and realize that they have something to do for others too. Another thing we really want to do is emphasize finding their passion, so if basketball’s your passion, you can go teach a group of younger kids at the YMCA, or bringing it back to your community, and just bringing whatever they really find passion in, and turn it into some kind of community service. Nutmeg: Sooo Lucky- why do you do camp? Lucky: There are so many reasons… I think I do camp because, I mean- camp really means a lot to me, its something that I think kept me in college, and it really means a lot to me to see kids really blossom up the mountain and realize that they can do the same thing back home, and really accomplish what they set their minds to, I just love spending time with the kids, I think that’s the best part. And being able to do it with you know, a hundred other volunteers that are just as excited and willing to help them and finding friends that you know you’re going to be friends with for a long time, you know, only adds to it (laughs) I think that’s why I do camp. Yeah.